Most of the world is living in the dark ages of headphones. (iPod earbuds, I’m looking at you.) That’s sad, because it’s a great time to buy pro-quality headphones: they’re better-sounding and cheaper than ever. Reference/Audiophile: For studio applications or just enjoying listening, there’s a range of new open-air and closed-back models. Here come the clunky model numbers: ATH-AD700, ATH-AD500 and ATH-AD300 Open-Air Dynamic Headphones and ATH-A700 and ATH-A55 Closed-Back Dynamic Headphones. 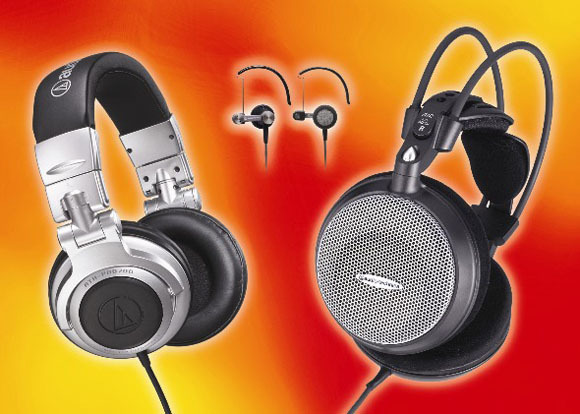 DJs: Pro reference headphones for DJ applications: ATH-PRO700 SV, ATH-PRO5 V and ATH-PRO5 MS. Replacing those $#&*$# iPod Headphones: Clip-on headphones and earbuds for listening to your portable player the way it was intended to be heard: ATH-EW9, ATH-EM9r and ATH-EM7 GM Adjustable Clip-On Headphones; ATH-CM7 SV and ATH-CM7Ti Ear-Bud Headphones; ATH-EC7 GM Ear-Bud/Clip-On Hybrid Headphones; and ATH-ES5 SV Portable Folding Headphones. Coolest of the new announcements are the portable headphones: they have an avant-garde design reminiscent of Bang and Olufsen, and are made of materials like Japanese Hokkaido cherry wood, aluminum, and titanium. I’m still partial to the Shure E series headphones because they can do double-duty as onstage monitors, but I’m intrigued by the new A-T offering. Prices starting at US$119 and running up to about $300 list. Then again, I keep seeing people buying $400 iPods and $1000 audio interfaces but listening through total crap. Hint: start spending where your actual ears are. Got a favorite pair of headphones for listening in your studio? At the gym? (Hey, sitting here and programming Max/MSP patches ain’t gonna keep me in shape.) Hit comments and let us know.